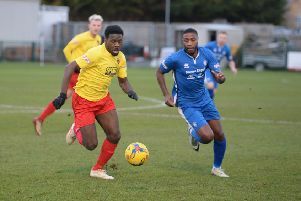 Terry Griffiths’ double ensured AFC Dunstable maintained their Southern League Division East play-off place by beating Northwood on Saturday. The hosts went close on 18 minutes when Bill Morgan’s header was just over the top, as the visitors responded with an effort of their own. Nathan Frater’s effort was cleared off the line, before AFC took the lead on 33 minutes when Drew Roberts’ cross was headed home by Griffiths at the back post. Frater looked to double the advantage, his run and shot saved, but in the second period, Uxbridge were back on level terms when Dylan Kearney netted. However, AFC were only pegged back for eight minutes as Griffiths had his second of the afternoon. Keeper Jamie Head ensured AFC finished with the points making a great save in the closing stages. AFC visit second placed Beaconsfield this weekend.